Having a room devoted to watching films and television is becoming increasingly popular as television sets get bigger and a glut of streaming content makes it possible to watch something brand new every single day without having to rewatch anything. While you might think that all you need to create a home theater is a big tv and a dark room, it’s important to have the proper lighting in your home theater to make the experience one that is almost as good as going to a traditional theater. In this blog, Butler Lighting will give you some tips to help you design the perfect lighting for your new theater. When you need interior or exterior lighting, Butler Lighting is ready to help. Not only can we teach you what lighting works best in each room of your house, we also have an incredible selection of lamps, chandeliers, recessed lighting, and other fixtures to match your decor. Shop online, or stop by our showrooms in High Point, Greensboro, or Winston-Salem to see our lights in action. It might seem counterintuitive, but it is possible for a home theater to be too dark. The next time you go to a theater, check out what they’ve done and then try to replicate it in your home. You’ll notice that there are dimmed lights along the side of the theater and along pathways that lead from the doors to the seats. While you might not need a lit-up path, it is a good idea to have some some soft, ambient lighting on the walls or behind where you sit. This makes it easier for you to get up for snacks or to use the restroom because they will help keep your eyes from dilating too much. Chances are good that your home theater will be used for dedicated movie nights and for a variety of other purposes like eating special meals with your family while you’re enjoying a favorite tv show. Having several “layers” or types of lights can keep the room flexible and functional. In addition to the dimmable lights we mentioned in the last section, it’s a good idea to add some direct task lights to the ceiling (recessed lighting is a solid choice) so that the room can work as more than just a theater. Lamps on the sides of seats can also be helpful if one or more of your family members likes to hang out in the same room with you but would like to read a book or magazine instead of watching whatever is on the screen. Our helpful lighting experts will also cover what types of lights work best in different kinds of home theaters (LED, halogen, etc. ), and how your choices can save you money through decreased energy usage. If you want your theater to feel like a futuristic space that could have sprung directly from your favorite sci-fi flick, Butler Lighting has all of the most modern lighting options available to make the space feel clean, shining, and sterile. Or, if your theater has an old-school feel, add some elaborate sconces along the walls to give it that old, “movie-house” vibe. If you have a bar in the back (an increasingly popular addition to home theaters), add a fixture with a traditional flair to complete the look. The options are almost endless! When you come in to one our showrooms, bring pictures of your home theater so we can perfectly match light fixtures to the decor. 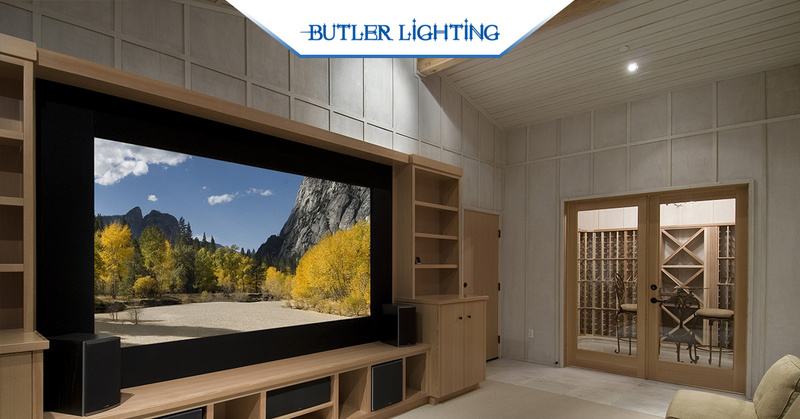 As you can see, lighting a home theater can be a bit of a process, but we try to make it as smooth as possible when you come to Butler Lighting. Our lighting experts have been helping people make the most out of their indoor and outdoor spaces for many years and they can’t wait to make your new home theater come to life! Stop by any of our showrooms today or check out our online lighting store to get some ideas about how to light any room in your house. We offer unbeatable selection and unbeatable customer service to every person who walks into our stores. Come by and see us soon or contact us if you have questions!